CBC News has learned there are still two women in hospital with serious injuries eight days after an explosion and fire at the Consumers' Co-operative Refineries Ltd. refinery in Regina. The explosion on Oct. 6, 2011, forced 1,400 people to leave the the facility in north Regina, and has had a major impact on its ability to produce diesel fuel and gasoline. In a news conference Friday morning, officials with Federated Co-operatives Ltd, which owns the refinery, said a total of 36 people were injured from burns or smoke inhalation, although most of the injuries were minor. Previously, they had believed 13 people were hurt. 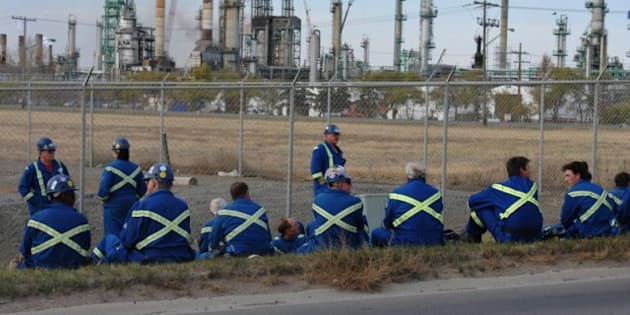 Refinery officials will not comment on the condition of the injured people, although CBC news has learned two women are still in hospital. One woman, who works for a scaffolding company, is in an intensive care unit in Regina. The other woman has been transferred to Edmonton's burn unit. Officials with FCL and Regina Fire and Protective Services also gave an update to the facility's operations and the investigation into the explosion. They said safety concerns have prevented fire investigators from accessing the areas they need to finish their assessment, so there is still no information on the official cause of the explosion. Investigators were expected to get into those areas Friday afternoon. "This is a lot more complex than a single family dwelling investigation, said Albert Headrick, the fire department's deputy chief of public safety, planning, and prevention. "So it's going to take some time." Immediately after the explosion in the diesel processing area of the plant, FCL officials said they believed the cause to be a pipe leaking a mixture of diesel and hydrogen gas which found an ignition source. The refinery's production has been affected by the accident. Diesel production is expected to remain down by 20 per cent until May. Gasoline production, which was cut in half after the explosion, is expected to be at 90 per cent capacity by the weekend. "I'll be clear. We have some concerns on supply," said Vic Huard, FCL's vice-president of corporate affairs. "But I want to be also clear that we have a plan and I'm pretty confident we can execute on that plan in terms of mitigating those concerns." Refinery officials said there have been no lay offs of refinery workers following the fire. They said they are also trying to keep contractors employed, but gave no guarantees. There are 11 companies supplying 1,000 employees to work on renovations in the area of the explosion. The work is part of a $1.9 billion expansion and revamp of the refinery that is expected to increase its ability to process crude oil by 30 per cent.